When you have worked out that keeping your boat out of the water is a massive saving and the lack of antifouling improves fuel economy and performance, you need to talk to us about the latest boat lift. Just $25,000.00 for a 7m multi or mono installed S. E. Qld, the Jiffy Boat Lift will be at the top of your boat lift shopping list. Simple to install, operate, and eliminates the known problems of other types. Raise and lower with boat level. Easy access to the boat while raised. Just drive in and press the button for a clean, environmentally safe and economically sound investment. Made from UV stabilized polyethylene and marine grade aluminium, our modular DIY boat lift is able to be easily assembled near your boat ramp ready to be operational within a few hours. The decking on both sides of the lift gives ease of access to the vessel. There are no underwater mechanical moving parts or metal to corrode or seize. The lift can be left in its raised position without any need for maintenance, year in or year out. The polyethylene is fully UV stabilized and which equates to approximate 25 year life to exposed surfaces. The modular blocks and parts make for great ease of transport and assembly. 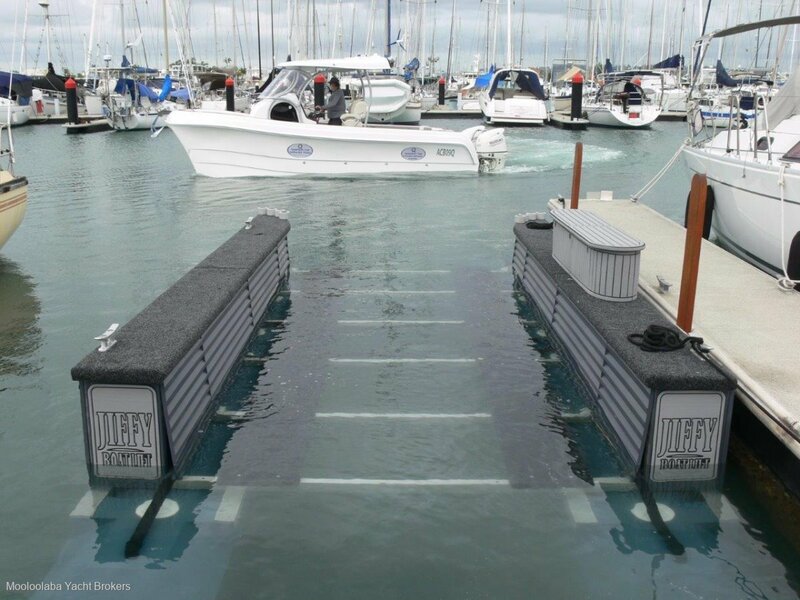 The Jiffy Boat Lift can be assembled near the water and motored or towed to an existing marine berth or used in a mooring application as well as a waterway pontoon deck. The Boat Lift has an easy controlled sinking mechanism and a low pressure blowing system for raising. Everything is self contained within the structure and requires no additional pumps or equipment etc. On a marina application, the unit simply plugs into the existing marina power socket. This system accommodates both mono hulls and catamarans. Our base model shown here, will easily lift 3 tons (7 metre boat), so for larger vessels, we simply add extra modules to lengthen and widen to accommodate.